During the 1970s and early ’80s, every announcer or writer had to dish the dirt on his story. He played major league baseball in summer, but Richie Hebner dug graves in winter. Beginning in the ninth grade, he continued digging throughout his 18-year major league career, even when free agency expanded his paychecks beyond 1976, and 20 years after retirement. Hebner aimed his cryptic humor at everyone throughout his career. In good times, he could be a prankster, free spirit, and autograph-friendly with his admirers. At other times, he might act fidgety, hot-tempered, or cold to the same fans. However, he also dug himself a respectable baseball career as a player, coach, and manager over the course of five decades. Hebner lettered four years in baseball at Norwood Senior High School, but he made his biggest impact on the ice. He won scholastic All-America honors in hockey all four years. Playing in the Bay State League, the left winger notched 69 goals. In that time, Richie led his Mustangs to a 47-11-5 record, including two Bay State League titles. Although Norwood was eliminated in the quarterfinals, Hebner was voted State tournament MVP in his senior year. Hebner capped his hockey career by scoring the game-winning goal in a 1969 1-0 game against Walpole. He reflected on that goal, “I’ll never forget that night. We had always been a big rival of Walpole and it seemed the entire sports fans of both towns just lived for that game. That goal has to be the biggest thrill of my life and I never expect another like it.”9 Norwood retired Hebner’s number 18 in his honor. Hebner faced a dilemma at graduation; to sign with the NHL’s Boston Bruins or try professional baseball. In 1966, major league baseball held its second amateur draft. The Pittsburgh Pirates made the 18-year-old shortstop their first pick (15th overall). The Bucs’ New England scout, Chick Whelan, signed him with a $40,000 bonus, which beat the Bruins’ $10,000.12 Hebner recalled, “I loved hockey and had my biggest thrills in it, but I knew the money and the future was in baseball. If I had to choose between the two with the same amount of money for both, I would have taken baseball.”13 He signed with the Pirates and went to Single-A ball in Salem, Virginia, of the Appalachian Rookie League. As the Vietnam War escalated, the Pirates assigned Hebner and pitching prospect Bob Moose to fill the last two openings for the Marine Corps Reserve. From 1966 through 1972, Hebner would report one weekend a month along with a two-week hitch each summer. In his first professional season, he played first base in only 26 games with Salem. The 18-year-old led the Rebels with a slash line of .359/.443/.652. Then Pirates general manager Joe L. Brown informed him in August to pack for six weeks of Marine Corps training at Parris Island, South Carolina.14 By the end of his training stint, the 6’1” private returned at a muscular 195 pounds, the weight he would maintain the rest of his playing career. In 1967, Hebner moved up to the Raleigh Pirates of the Carolina League for 78 games at third base. His solid hitting (.336/.411/.456.) landed him in the league’s All-Star Game.15 But after striking out in late June, Hebner punched the dugout roof in anger and broke his right hand. “That hand hurt for three months,” he added as he reflected on his gaffe.16 He missed the last two months of the season. Hebner played mostly at third base in 1968, his final minor-league campaign. His solid play for Columbus earned him a call-up to the Pirates in late September. His first plate appearance produced a non-event due to a set of quirky circumstances. Against the Reds on September 23, Hebner pinch-hit for another pinch-hitter, Manny Jiménez, who had been ejected after a disputed second strike. Hebner thus had to begin his career in a two-strike hole. He anxiously watched the first major-league pitch he saw, a pitchout, nab pinch runner Freddie Patek trying to steal second base. The tag ended the inning and delayed Hebner’s official debut. Five days later, he earned his first full plate appearance in Chicago. Facing future Hall of Famer Ferguson Jenkins, Hebner flied out to left field as a pinch hitter in a 4-3 Pirates loss. His first big-league hit would have to wait until next year. At the end of the ’69 season Hebner seemed in the running for Rookie of the Year. Both he and first baseman Al Oliver produced strong rookie stats while also sharing the same Topps rookie card. When the votes came in, Oliver earned second place to the Cardinals’ Ted Sizemore for the award. Hebner earned no votes, despite being the only rookie to hit above .300 (.301). He also produced an OPS of .801 to Oliver’s .788 and Sizemore’s anemic .670. On July 16, 1970, the Bucs moved into their new home, Three Rivers Stadium. Hebner christened the park with its first base hit and scored its first run. 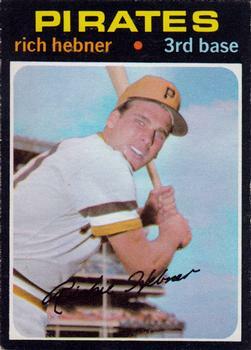 As the Bucs headed toward the first of three straight Eastern Division titles, Hebner’s best game came on September 7 when he slammed two home runs, a double, and four RBIs while scoring three runs in an 8-3 win over the Cubs. He hit a solid .290, improving his power from eight to 11 homers. However, for the second straight year he committed 19 errors and fielded in the .940s. His shaky defense would eventually prompt a move to first base in later years. In the National League Championship Series, the Cincinnati Reds swept the Pirates in three straight games. Hebner went four for six with two doubles and two walks, but the Pirates scored just three runs the entire series. It would be the first of his NL-record eight LCS appearances. Hebner increased his power to 17 home runs and 67 RBIs in 1971, but injuries, illness, and military duty limited him to 112 games. After playing in San Diego on July 24, he stayed in California for a two-week stint with the Marine Reserves at Camp Pendleton. On his first day back on August 11, he had two hits, including a bases-loaded walk-off single to drive in the winning run. The next day he started a 0-for-16 slump. At one point, in three losses to St. Louis, he struck out a record-tying eight consecutive times. “I should have struck out a ninth time to set the record,” Hebner said.19 Instead, he popped out to third base to end the pain. Soon after, a viral chest infection forced him into the hospital for two weeks.20 When he returned Hebner struggled the final 17 games, hitting.200 with no home runs and only two RBIs. His power, however, would soon return in his second NLCS. In the 1971 NL playoffs, the Pirates split the first pair of games in San Francisco with the Western Division Champion Giants. When the series shifted to Pittsburgh, Hebner’s power returned to propel the Bucs to the pennant. In a tight 1-0 affair in Game Three, Hebner made a crucial throwing error to allow the Giants to tie the game in the sixth inning. In the bottom of the eighth, he atoned for his mistake by smashing a go-ahead homer off future Hall of Famer Juan Marichal that held up for a 2-1 win. The Pirates clinched the pennant the next day as Hebner, Oliver, and Roberto Clemente each drove in three runs in a 9-5 win. Scoring after a double in the first inning, Hebner then slashed a three-run homer off future Hall of Famer Gaylord Perry in the second to tie the game. Oliver followed with a three-run shot of his own to finish the scoring in the sixth and send the Pirates to the World Series. Hebner played in only three World Series games against the heavily favored Baltimore Orioles. Manager Danny Murtaugh platooned him at third with the righthanded José Pagán, who drove in the Series-winning run in Game Seven. In his limited time, Hebner managed yet another post-season homer off a Hall of Fame pitcher, Jim Palmer. This one, however, was a meaningless three-run dinger in an 11-3 loss in Game Two. Nevertheless, Hebner became a World Champion for the only time in his career as the Bucs beat the Orioles in seven games. The Pirates and Cincinnati Reds split the first two games of the NLCS in 1972. The Pirates hit only .190 as a team, and Hebner scratched out only two singles and a double for a .188 average. Pitching enabled the Bucs to stretch the series to its final game. The Pirates led, 3-2, in the ninth but lost when Bob Moose uncorked a wild pitch that scored the pennant-winning run. The loss soured Hebner on the rest of the postseason. “I didn’t watch the World Series on TV that year,” he said.22 It was also the last game he would play with his teammate Roberto Clemente. On New Year’s Eve, Clemente perished in a plane crash trying to send relief supplies to earthquake-stricken Nicaragua. Clemente’s death numbed the team and all of Pittsburgh throughout the 1973 season. Hebner’s temper compounded the heartbreak as his anger boiled several times with Virdon. First in May, and then August, the two men confronted each other. After committing only nine errors in ’72, Hebner’s concentration began to wane. Virdon fumed as his third baseman lost focus throughout the summer. On August 12, Virdon replaced Hebner in the ninth inning of a 5-2 win with shortstop Gene Alley, who had never played third. The move led to a cursing match, with Virdon challenging his third sacker to fight.23 24 Hebner didn’t take the bait. Both men’s tempers simmered until the Pirates fired Virdon on September 7. The Bucs then brought back Murtaugh to spark a September drive that failed on the final day. The Pirates reclaimed the NL East crown in 1974 as Hebner continued to play well. He hit a solid .291 with career highs in runs scored (97) and hits (160). It would be his last good season in Pittsburgh. In the NLCS, the Western Division champion Dodgers beat the Bucs three games to one. Hebner’s homer led to the Pirates lone victory as he hit a mediocre .231 with four RBIs in the series. Hebner struggled in 1975 with a career-low .246 average; he slugged below .400 for the first time (.392). Twice he suffered back injuries that sidelined him for a week, once in July and again in September. The Pirates returned to the playoffs but Cincinnati’s Big Red Machine swept them. In the three games, Hebner hit .333 but with only a double and two RBIs. It would be his fifth and final appearance in the NLCS with Pittsburgh. In December 1975, the players’ union broke the 97-year old reserve clause. Players who went through the 1976 season without signing a contract would be free agents the following year. Hebner became one of the first such players. His struggles at the plate in ’75 led Pirates General Manager Brown to offer Hebner a contract with a 20% renewal-clause pay cut for ’76 ($62,500).25 Initially, he chose not to sign, hoping to hit better as the year progressed to convince the Pirates he deserved more. Instead, Hebner suffered his worst season as a Buc in 1976. His slash line of .249/.325/.366 led to his lowest OPS of his Pirate career, .692. On November 1 he became a member of the first group to explore true free agency. He first negotiated with new Pirates’ GM Pete Peterson. They met in Pittsburgh’s US Steel building, where Peterson offered him a deal for $80,000, 90,000, and $100,000 across three seasons.26 The talks turned muddy and Hebner soon left for a USO tour in Germany. When he returned on December 6 his agent, Ed Kleven, produced an offer from GM Paul Owens of the Phillies for $600,000 over three years. “Well, I didn’t go to Harvard, but I ain’t that stupid,” Hebner said.27 He signed with Philadelphia on December 15, 1976. Used to winning with the Bucs, Hebner was pleased to make the cross-state move to the Phillies, who had taken the NL East in ’76. He also made a cross-diamond move to first base as future Hall of Famer Mike Schmidt already held down the hot corner. In spring training on March 23, Hebner collided at first base with ex-teammate Larry Demery. The impact fractured his left rib cage.28 He missed the first 14 games before he debuted on April 29. Though he played in only 118 games, he delivered a strong slash line of .285/.381/.484 with 18 homers and 62 RBIs. The Phillies and Hebner returned to the NLCS to meet the West-winning Dodgers. After splitting the first two games, the Phillies were leading 5-3 in Game Three, going into the ninth. In this game Hebner would tie a NLCS record for putouts (14) including nine in a row. But it was a putout that he didn’t get that created the Series’ biggest controversy. With the Phillies up 5-4 and two out in the ninth, Davey Lopes’ grounder bounced off Schmidt at third to shortstop Larry Bowa. Bowa’s throw seemingly beat Lopes at first, but umpire Bruce Froemming called him safe as the tying run scored. The go-ahead run scored a batter later, and the Dodgers held on in the ninth to win Game Three. To this day Philadelphia fans refer to this game as “Black Friday.”29 The television replay supported Hebner’s claim that Lopes was out. “It was close but out,” Hebner cried. “I couldn’t believe it. He did not beat the bleeping ball to first.”30 Nevertheless, the next day the shocked Phillies managed only an RBI double by Hebner as the Dodgers claimed a 4-1 win and the NL pennant. Hebner reprised his 1977 season with a similar output in 1978. He slugged 17 homers with 71 RBIs and again surpassed an OPS of .800 (.834). The Phillies and Dodgers met again in the NLCS. This time the Dodgers swept the Phils in three games. Hebner produced his worst numbers in a championship series. In 10 plate appearances he managed one hit, a sacrifice, and an RBI. However, in December the Phillies seized the chance to land Pete Rose to play first base. Subsequently, Paul Owens said, “Two days after we signed Pete Rose, 11 clubs got in touch with me and said: ‘If you decide to trade Hebner, keep us in mind.’”32 Owens managed to find a trading partner near the end of spring training. The swap would move Hebner away from 2.5 million loyal fans to play before less than a million bitter critics. During his hot streak, he drove in six runs in a game twice within 34 days. First, on May 20, he led the Tigers to a 12-8 win with a grand slam off the Yankees’ Tommy John and a two-run shot later on. Five weeks later, he drove in another six-pack against Cleveland with a three-run double, two-run single, and a groundout. He capped his hot sreak on June 3 with a two-run pinch-hit walk-off homer against Seattle. At the All-Star break, he had 60 RBIs on only 64 hits and a slash line of .303/.367/.493. He had driven in more runs than both Rod Carew (34) and Cecil Cooper (53), the AL representatives at first base. Since the Tigers platooned him, Hebner was never seriously considered over either player. Hebner cooled off during the second half of the year as a knee injury forced him out of 32 of the final 40 games. He ended the season with a career-high 82 RBIs and a respectable .826 OPS. In 1981 the player’s strike carved out the middle third of the season. Two weeks after the strike began on June 12, Hebner headed home to keep busy with his usual off-season gig of digging graves in his father’s West Roxbury cemetery. Baseball writers scrambled for stories of how players spent their summer vacations. Hebner’s holiday proved to be the most popular. Even People magazine published a photo of the Digger standing in a shallow grave, bare-chested, pick in hand.46 When the season resumed on August 10, Hebner continued his season-long struggle, posting his worst numbers yet, with five home runs, 28 RBIs and a weak OPS of .656. Hebner faced a different kind of split season in 1982, dividing his play between Detroit and Pittsburgh. By early August the struggling Tigers lost interest in the aging veteran and designated him for assignment. “They buried me there,” the gravedigger said ironically.47 The Pirates soon purchased him on August 16 where he finished the rest of the year in right field, the first time he played the outfield professionally. Hebner’s utility role fully emerged in 1983. The Pirates made him their main pinch hitter, while platooning him at third, first, and the outfield. In his new role as a part-timer, he connected on a number of key hits. On June 20, he led off the bottom of the 10th inning with a pinch-hit homer to beat the Cubs 5-4. He scorched the Cubs again on September 15, beating Lee Smith with a pinch-hit grand slam, his fourth and final career slam. The Bucs battled the last two weeks for the division lead, but the Phillies still edged the Pirates for the NL East crown. The Bucs planned to sign Hebner to lead their bench for 1984, but that January he left the Pirates via free agency for the second time and signed with the Cubs. In his career Hebner had victimized Chicago more than any other club, averaging .330 with 30 home runs and 109 RBIs.48 Hebner also favored the Cubs’ home park, saying, “Wrigley was fun…I think I hit pretty good in Wrigley.”49 Indeed, for his career in Chicago he posted a slash line of .317/.386/.493. In limited duty with the Cubs, Hebner hit .333 overall with a career-high .407 OBP. In the first half, he blasted two key home runs. On April 24, he snapped a 2-2 tie in the ninth inning with a home run off future Hall of Famer Bruce Sutter as the Cubs beat the Cardinals 3-2. On May 8, he broke a 9-9 tie with a pinch-hit homer to set up a 12-11 Cub win. That blast was his 200th career home run.50 His clutch hitting stalled at the end of June when he went on the disabled list with shoulder tendinitis.51 He returned in September to finish the season weakly, 1 for 7 as a pinch hitter. The Cubs fared much better, winning the division and playing in their first postseason since 1945. It marked Hebner’s record eighth and final appearance in the NLCS.52 He appeared in only the final two games as a pinch hitter, as San Diego claimed their first NL pennant, sweeping the last three games of the five-game Series. In spring training 1985. Hebner and his wife Pat welcomed their second daughter, Katherine. But soon after, his mother died in Boston on March 30.53 He rejoined the Cubs in mid-April. He started off hot and by mid-August he had driven in 12 runs on 12 pinch hits, leading the league in both categories. After hitting his seventh career pinch-hit homer on August 14, he went 0-for-22 the rest of the season. Despite the collapse, his 12 RBIs still ended the year as the most for a pinch hitter. In his only start of September, Hebner slammed a double and a home run to drive in two runs in a 6-2 win over the Phillies on September 29. The home run turned out to be his last major league hit. He pinch-hit twice more, flying out and drawing a walk to score a run in his final act as a major leaguer on October 3. At the time, he thought he would be back in 1986, and so did the Cubs. In his first year managing in 1988, Hebner won Manager of the Year with Myrtle Beach in the South Atlantic League. He also managed in Triple-A at Syracuse (1995-96) and Nashville (2000), as well as Single-A in Frederick (2008-09). Between stints as a minor league manager, Hebner served as hitting coach at the major league level in Boston (1989-91) and Philadelphia (2001). In the minors, he tutored hitting at Syracuse (1993-94), Nashville (1998-99), Durham (2002-06), Birmingham (2007), Norfolk (2010) and Buffalo (2014-16). This biography was reviewed by David Lippman and fact-checked by David Kritzler. 1 Richie Hebner, interview, Durham, North Carolina, May 6, 2015. 2 Jim Perry, “The Pirates’ Gravedigger,” Los Angeles Herald Examiner, May 18, 1969: B1. 3 Charley Feeney, “Gravedigger Hebner Comes Alive as Bucco Hot-Corner Guardian,” The Sporting News, April 5, 1969: 16. 4 Robert Carroll, “One Way or Another, Richie Hebner Has Always Dug His Job,” Boston Globe (Boston, MA), May 12, 2005:10. 5 Fred Ciampa, “Civil War in Making In Hebner Household,” Boston Record, December 22, 1971. 7 Frank Wall, “Profile Richie Hebner: Little League To The Majors,” Norwood Messenger (Norwood, MA), April 9, 1969: 28. This article provided much of the background on his youth sports and high school playing. 12 Charley Feeney, “Hebner New Sizzler at Buc Hot Corner,” The Sporting News, May 24, 1969: 3. 15 All minor-league statistics taken from Baseball-Reference, http://www.baseball-reference.com/register/player.cgi?id=hebner001ric (accessed January 13, 2015). 16 Charley Feeney, “Day Brown Met Hebner: The ‘Tooth-Less’ Greeting,” Pittsburgh Post Gazette (Pittsburgh, PA), May 6, 1969: 28. 20 Associated Press, “Pirates Hope to Avoid Repeat of 1971 Slump,” The Victoria Advocate (Victoria, Texas), July 27, 1972: 2B. 22 http://wetbin.com/richie-hebner-recalls-major-league-post-season-play/ Blog “Richie Hebner Recalls Major League Post Season Play,” December 10, 2007. 23 United Press International, “Pirate Spat: Everybody In the Dark,” New York Times (New York, NY), August 14, 1973: 29. 24 Gerry Dulac, “New Digs: Hebner Back in Minors as Manager,” The Pittsburgh Press, April 17, 1988: 71. 25 Ed Rose, Jr., “Brown Backed Hebner Into Corner,” Beaver County Times (Beaver, Pennsylvania), March 30, 1976: 51. 28 Ray Kelly, “Suffering Phillies Hope Hebner Rib Mends in a Hurry,” The Sporting News, May 7, 1977: 8. 29 Jeff Schuler, “Phillies, Dodgers Have Playoff History,” Morning Call (Allentown, PA), October 8, 2008: C1. 30 United Press International, “Hebner of Phillies Sure Lopes Was Out at First,” Lodi News-Sentinel (Lodi, California), October 8, 1977: 7. 31 , Joseph Durso, “Mets’ Bet May Sour,” Morning Journal (Daytona Beach, FL), May 30, 1979: 5B. 32 Joseph Durso, “Mets’ Chances Fade On Deal for Hebner, New York Times (New York, NY), March 9, 1979: A21. 33 Joseph Durso, “Hebner Trade Rattles Mets Pitching Plans,” New York Times, (New York, NY), March 29, 1979: B11. 35 Joseph Durso, “Mets and Hebner Start Fast in 10-6 Victory Over Cubs,” New York Times (New York, NY), April 6, 1979: A21. 36 Thomas Rogers, “Phils Sweep Mets, 3-2, 6-3,” New York Times (New York, NY), April 16, 1979: C4. 38 Joseph Durso, “Mets Trade Hebner for 2 Tiger Players,” New York Times (New York, NY), November 1, 1979: B11. 39 Jack Lang, “…And Mets Observe Day of Atonement,” The Sporting News, November 17, 1979: 65. 40 Associated Press, “Mankowski, Morales Swapped For Hebner,” The Globe and Mail (Toronto, Ont. ), November 1, 1979: P58. 41 Tony Zonca, “Richie Hebner Digs Detroit,” Reading Eagle (Reading, PA), April 13, 1980: 82. 46 Richard Griffin, “Hebner Really Digs Job With Jays,” Toronto Star (Toronto, Ont. ), March 5, 1995: B4. 47 Charley Feeney, “Bucs Give Hebner All-Purpose Role,” The Sporting News, August 30, 1982: 43. 48 Dave van Dyck. “Hebner Bolsters Club Bench,” The Sporting News, January 16, 1984:42. 50 Fred Mitchell, “Shoulder Better, Hebner Hopes to Be Big Hit Again,” Chicago Tribune (Chicago, Ill.), March 25, 1985: 8. 51 Philadelphia Media Network, “‘Mouse Davis’ Tackles a Mighty Task,” Philadelphia Daily News, (Philadelphia, PA), July 19, 1984: 91. 52 Peter Pascarelli, “McReynolds Lost for World Series,” Philadelphia Inquirer (Philadelphia, PA), October 8, 1984: E7. 53 Mike Kiley and Fred Mitchell, “Dotson Faces Test For Spot in Sox Rotation,” Chicago Tribune (Chicago, Ill), April 1, 1985: 3. 54 Peter Gammons, “Dig This,” Orlando Sentinel (Orlando FL), January 26, 1986: C16. 55 Fred Mitchell, “Cubs’ Boss Green Takes His Swings, Hebner Cut, Fontenot Demoted,” Chicago Tribune (Chicago IL), April 2, 1986: 1. 56 Jerry Sullivan, “Herd Coach Kept Great Company As a Player,” The Buffalo News (Buffalo, NY), May 31, 2014: B1. 61 Paul Patton, “Intercounty is Feeding Majors,” The Globe and Mail (Toronto, Ont. ), May 12, 1979: S6. 62 The author vended concessions at Three Rivers Stadium when Hebner played in Pittsburgh. In 1973, Hebner cracked a bat during batting practice and gave it to the author who still owns it. The bat does weigh 40 ounces. He autographed it after being interviewed in Durham, North Carolina, on May 6, 2015. Hebner then took it into the Buffalo Bisons’ clubhouse to show it to his players who expressed great surprise over the size of the bludgeon their coach once wielded. 63 David H. Lippman, personal email, March 3, 2017.